Since today was a sea day we woke up rather late this morning. When we opened the curtains we saw something that we did not expect to see… land. As this was supposed to be a sea day so why was there land in sight? We thought there had to be something wrong, why else would the captain have rushed the ship towards land. But why didn’t we hear any announcements over the PA, informing the passengers what was going on? Luckily no announcements or alarm signals means there is no reason to panic! Having no idea where we were we turned on the tv to see if the map, showing the location of the ship, could make us any wiser. 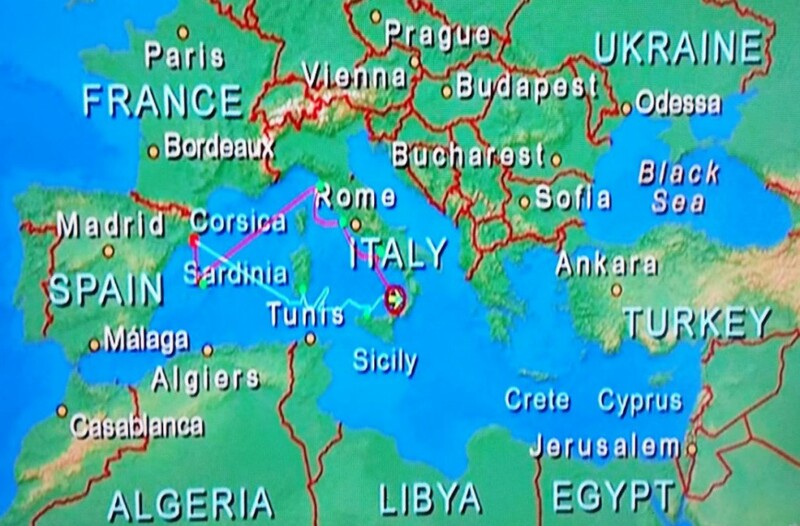 Since this was the first time we really paid any attention to the map, we also noticed that the captain had taken the ship on a little detour between Cagliari and Palermo. Another map finally showed us where we were and what we were seeing. 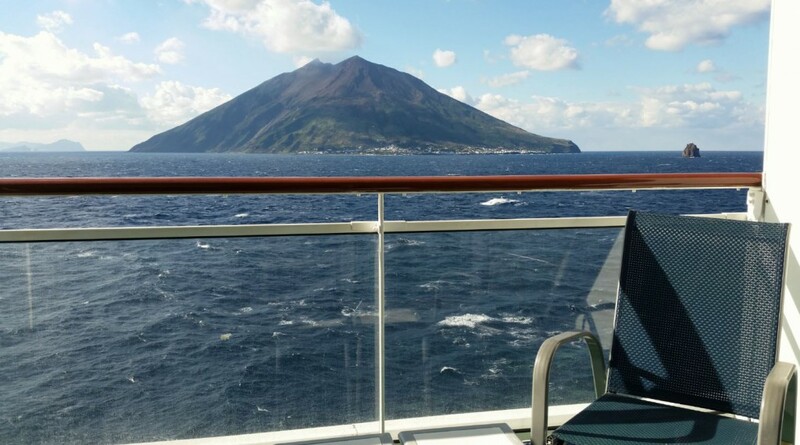 It turned out that captain had decided to make another little detour, giving us a mini-cruise around Stromboli. Stromboli, a small island in the Tyrrhenian Sea, is one of the eight Aeolian Islands. Located off the north coast of Sicily, it contains one of the three active volcanoes in Italy. The vulcano is one of the most active vulcanoes in the world with constant minor eruptions, the most recent major eruption was on 13 April 2009. Because of the eruptions, often visible from many points on the island and from the surrounding sea, the island is nicknamed “Lighthouse of the Mediterranean”. About 500 people still live on the island. 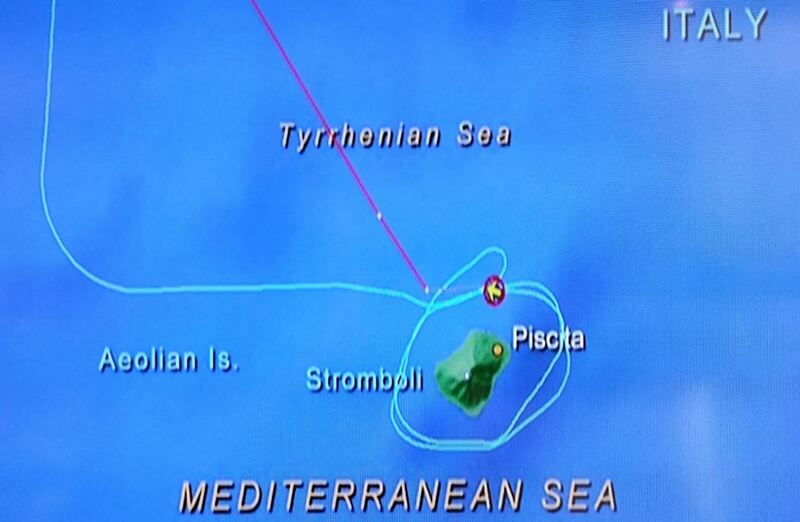 Strombolicchio, or Little Stromboli, located 2 km (1.2 mi) to the northeast of the island, is the remnant of the original volcano from which the island of Stromboli was built up.